Founded in 1805 by Colonel William Ward, he chose the name Urbana based on the word "urbanity" which was based on a Greek word meaning politeness. The town was incorporated in 1868 and today has a population of about 12,000 residents. Urbana is small-town America. Don't be surprised when complete strangers smile and wave. The historic town square, built around a Civil War monument, is encircled by unique, locally owned shops and boutiques. For example, Carmazzi’s corner store. Carmazzi's hasn’t changed much since it opened over 100 years ago and is packed with 100s of items including penny candy. Sweet Annie’s for ladies and the home, offers elegant dresses, dolls, and unique collectibles. Kaleidoscope is a one-of-a-kind shop stuffed with antiques and collectible flea market finds. Or stop in the new Cafe Paradiso on Monument Square (reservations are suggested for Friday and Saturday evenings). In September there is the Ohio Fish & Shrimp Festival held at the Freshwater Farms, which Ohio's Largest Indoor Fish Hatchery. Freshwater Farms raises rainbow trout, largemouth bass, yellow perch, bluegill, and channel catfish. Visitors can visit the sturgeon petting zoo or feed the trout. The hatchery is open year round, Monday - Saturday 10 - 6, but is closed on Sundays and major holidays. Located at 2624 N. US Hwy. 68, just north of the historic downtown Urbana. 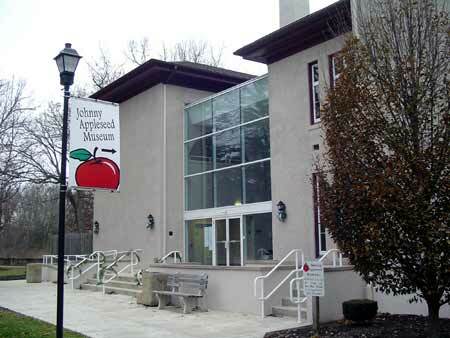 Located on the campus of Urbana University, the Johnny Appleseed Museum contains the largest known collection of memorabilia, written material, and artifacts about the early Ohio pioneer. The popular folk hero traveled all over Ohio, planted apple seeds, and developed a fine business selling his apple trees. The Johnny Appleseed Society provides programs for school and church groups, senior citizens and bus tour groups. Tuesday - Friday 10:00a.m. - 2 p.m.
Backside of the Johnny Appleseed Museum on the Urbana University campus. Bailey Hall is on the left and Barclay Hall is on the right. The 2 buildings are now connected via an atrium. The Johnny Appleseed Museum is housed in the Bailey and Barclay Halls designed by architect W. Russell West, who also was one of the architects that worked on the Ohio Statehouse in Columbus. The reason the museum is located here is because Urbana University was originally established by the Swedenborgian Church in 1850. Johnny Appleseed was one of the church's missionaries that traveled throughout the seed spreading the church's mission. The Bailey Hall is named for Francis Bailey (a Revolutionary War veteran) who was also a printer who printed the papers distributed by Johnny Appleseed. 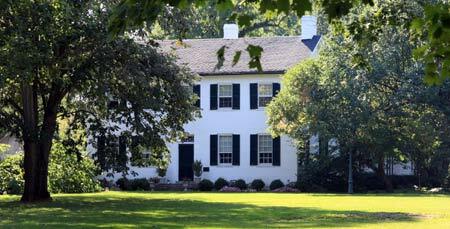 John Ward was the son of Urbana's founder, William Ward, had inherited a tract of land from his father. In his will, William Ward stipulated that a house be built on the land made from 26,500 bricks to be used by a local mason. The original house had 4 rooms. John Anderson and his wife Eleanor raised 7 children in the home. Two of those children became nationally recognized artists. In 1840 presidential candidate General William Henry Harrison brought his campaign to Champaign County. During his stay, a feast was held on the Ward Farmstead where they placed 12, 300 foot tables were spread out across the lawn to seat 1000s of people came from across the countryside to see and hear Harrison and feast on barbecued beef, lamb and drink barrels of cider. John Chapman was an American pioneer nurseryman who introduced apples to large parts of Ohio. He became an American legend because of his distribution of his journeys across Ohio and other areas as a missionary for the Swedenborgian Church. Along his journeys he distributed pamphlets about the church and used the appleseed as a metaphor for the church. John learned to be an orchard at an early age by working as an apprentice for an orchardist back in New England. When he was 18 years old, he and his younger brother left home and headed west. Records show that John Chapman was a land owner in Licking County in 1800 and by 1805 had a substantial apple orchard. He then began setting up orchards throughout north central Ohio. As he moved from area to area he would also take the opportunity to preach to those that would gather. During his sermons he used the appleseed as part of his message of planting something so small that would in time, produce so much fruit.